Hometown: South Orange, New Jersey, U.S.
Died: August 3, 2005 in Operation Iraqi Freedom. 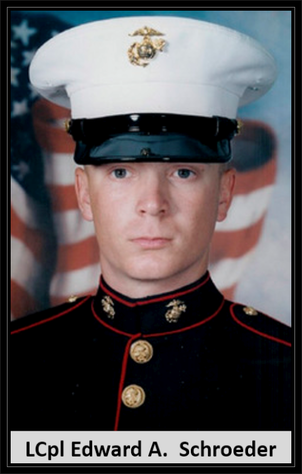 LCpl Corporal Edward August “Augie” Schroeder II, 23, of Cleveland, died Wednesday, Aug. 3, 2005, in Haditha, Iraq. He was the grandson of the late Lawrence and Mary Chapman of Wooster. Memorial services will be Thursday, Aug. 11, at 7:30 p.m. at Morrow Memorial Church, 600 Ridgewood Road, Maplewood, N.J., and Monday, Aug. 15, at 11 a.m. at Church of the Saviour United Methodist Church, 2537 Lee Road, Cleveland Heights. Interment will be in Lutheran Cemetery, Cleveland. Friends may call Saturday, Aug. 13, from 2-4 and 6-9 p.m. and Sunday from 2-4 and 6-9 p.m. at Wischmeier-Buesch Funeral Home, 3111 Broadview Road, Cleveland. The family suggests donations be made to West Orange First Aid Squad, 25 Mount Pleasant Place, West Orange, N.J. 07052; Christian Outreach Project, in care of Morrow Memorial Church, 600 Ridgewood Road, Maplewood, N.J. 07040; or the Augie Schroeder Fund, Cleveland Scholarship Program, 200 Public Square, Suite 3820, Cleveland 44114. Edward was born in Columbus, and was a 2000 graduate of Columbia High School, Maplewood, N.J., and had attended Ohio State University. He had been a printer at Deluxe Corp. in Streetsboro. Surviving are his parents, Paul E. Schroeder and Rosemary (Chapman) Palmer of Cleveland; a sister, Amanda Schroeder of Morristown, N.J.; aunts and uncles, Jeanette Schroeder of Cleveland, David (Virginia) Chapman of Cuyahoga Falls, Virginia (Thomas) Troyer of Stow, Noreen (Neal) Murray of Phoenix, Ariz., Norma Chapman of Avon Lake and Geraldine Chapman of Wooster; six great-aunts and uncles and 11 cousins. In addition to his maternal grandparents, paternal grandparents, Edward A. and Leona Schroeder of Cleveland, died previously.